In a lot of other cities, a landmark as prominent as Coit Tower might have been built in honor of a founding father or a military hero. But San Francisco isn't like a lot of other cities. The dramatic, 210-ft. fluted column atop Telegraph Hill was built by and named for an unconventional bonne vivante and social butterfly, Lillie Hitchcock Coit. Her lifelong passion for firefighters buoys a popular conclusion that the tower, design by Arthur Brown, Jr., was inspired by the nozzle of a fire hose. Completed in 1934, the tower was built with a bequest by Coit in excess of $100,000 for the purpose of constructing a monument to the City she loved. Coit, who came to San Francisco in 1851 at the age of eight, was rescued from a fire the same year. As an adult, she became an honorary member of Knickerbocker Engine Co. 5. History remembers Coit as an eccentric who smoked cigars and - gasp - wore trousers! When her husband, Howard Coit, died in 1885, widow Lillie took her sizable inheritance and went to live in Europe, where she was embraced by Parisian society. Coit died in San Francisco in 1929. 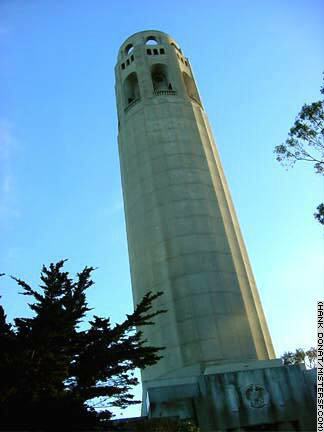 Coit Tower is built on the site of the first west coast telegraph, a semaphore completed in 1849. Later, an electromagnetic line took its place, followed by an observatory that burned down in 1903. While popular among visitors and filmmakers as an icon of San Francisco, Coit Tower is under appreciated by locals who are averse to the City's touristy side. The 39-Line from Washington Square makes for a convenient visit to graceful Coit Tower and its beautiful surroundings.